Winners from this year’s Urdd Eisteddfod will get the chance to take part in a Welsh Festival at Disneyland Paris. Mickey Mouse dropped into the festival in Cardiff last weekend to announce an exciting deal between the Disney organisation and the Urdd. Five of this week’s winners will be offered the opportunity to jet off to Paris next March to take part in the Welsh Festival. Eisteddfod Director Aled Siôn said the finalists will be selected from the best of Wales’ performers participating in song, drama, dance, poetry and arts. As Mickey Mouse was mobbed by exited children on the Eisteddfod Maes Peter Welch of Disney Destinations UK said: “Being a proud Welshman myself, I am delighted to be able to forge a relationship with the Urdd Gobaith Cymru. For the past four years, Disneyland Paris has celebrated all things Welsh at its annual Welsh Festival, where Mickey and Minnie appear in their traditional Welsh outfits, St David’s day fireworks lighting up the sky over Sleeping Beauty Castle and guests can have their face painted whilst enjoying an extensive array of festivities over the three days. Yesterday’s Disney announcement marked the most successful international Urdd Eisteddfod for years. Mr Siôn revealed the Urdd are expecting competitors from as far away as Singapore this year. A regional Eisteddfod for competitors outside Wales was held at the end of March with preliminary rounds for those wishing to compete in the National Eisteddfod. DISNEYLAND PARIS lands on Google Earth. Disneyland Paris in 3D takes vacation planning to new heights. Disneyland Paris is harnessing the power of Google Earth to build an interactive, three-dimensional tour of the Marne la Vallee-based resort destination that brings you one step closer to a true park experience. With direct links to Disney’s online travel-planning tools, Disneyland Paris in 3D will re-invent how people plan and book vacations. Following the successful launch of Google Earth for Walt Disney World Resort last summer, Disneyland Paris will be the first European Theme Park to be featured on the platform. Beginning on May 25th and as part of Mickey’s Magical Party–a year-long celebration of everyone’s favorite Mouse–Disneyland Paris guests can use Google Earth, a program which offers a 3D digital model of the world, to virtually tour Disneyland Paris’ two theme parks, its 7 hotels and Disney Village Entertainment Complex. “I have seen many amazing 3D models in Google Earth, but when I saw the new Disneyland Paris, I was blown away by how realistic it is. Disney’s artists have really outdone themselves. They have taken virtual tourism to a new dimension and are leading the way for photo-realistic 3D models in Google Earth.” said Brian McClendon, Engineering Director, Google Maps, Google Earth, and Sketchup. The depth and vivid detail of Disneyland Paris in 3D project makes this a unique, truly immersive experience within Google Earth. Visitors begin their virtual tour of the Resort with a stratospheric view of the globe, a starting point familiar to anyone who has ever used Google Earth. A skydive takes visitors past the French countryside to a view of Sleeping Beauty Castle at the heart of the Disneyland Park. Guests can then fly through the streets of The Walt Disney Studios, the entertainment offerings of Disney Village and around each of the seven hotels and back Main Street, U.S.A..
An overview of Disneyland Paris in 3D, along with instructions on how to get started, can be found at www.disneylandparis.co.uk/googleearth3d. You can explore Disneyland Paris in 3D by enabling “3D buildings” in the “layers” panel within Google Earth and searching “Disneyland Paris” in the “Fly to” bar. The most current version of Google Earth is required to see Disneyland Paris in 3D. Existing Google Earth users can check they have the latest version of the application by selecting “Help > Check for updates online”. In order to bring the magic of the Resort and Google Earth together in 3D, two photographers worked for 20 days to shoot all the visible surfaces of Disneyland Paris, including every building façade. A total of 85,000 photos were taken in all which became the start for some 1,587 3D models that populate the virtual tour. Disneyland Paris 3D creates a new level of usability for vacation planners and makes detailed information about one of the world’s foremost destinations available to Google Earth’s 400 million users, furthering the Google Earth team’s goal of recreating the world as it really is. 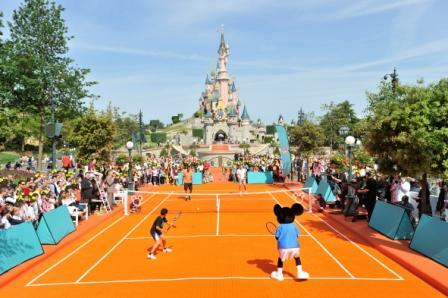 Visitors to Disneyland Paris today had a big surprise when they saw Mickey Mouse playing a game of doubles with invited children against professional tennis players Gael Monfils and Stansilas Wawrinka. The court itself was a little short and had quasi-official dimensions, but that didn’t matter when the children had such a great event. Disneyland Paris invited 200 children from the French “Fête le Mur” association, founded by Yannick Noah, to participate in this more than unusual exchange. The Fête le Mur association is set up in the heart of 25 under-privileged Urban Zones, allows the children of those neighborhoods to practice tennis, to train and perfect themselves, and some of them to later find a professional opening.